The holidays made for a crazy schedule. Here are my thoughts on at the 2015 DiabetesMine Innovation Summit. I�ve followed the DiabetesMine Innovation Summit online since it's inception, and this year (thanks to receiving a scholarship from DiabetesMine,) I was able to fly cross country and attend the 2015 DiabetesMine Innovation Summit, on November, 20th, 2015. The summit brought together all the key game changers in the diabetes world in all dimensions. Patient Advocates who live with D 24X7, �designers of current and future devices, clinicians, R&D, Pharma Marketing, regulatory, groovy tech gurus,and more! 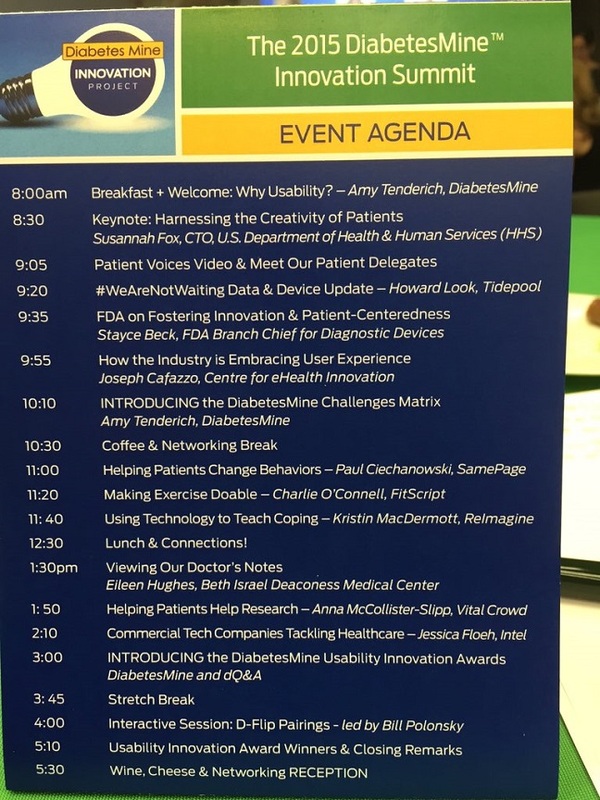 The agenda was jam packed and much of the focus centered on the major challenges of living with diabetes (see amy�s slides,) and usability factors being KEY. I LOVED that D patient challenges and usability in design took center stage! Topics addressed harnessing the creativity of patients; behavioral aspects of living with a D 24X7, patient life hacks, design aspects of D products, industry embracing the patient experience, getting the FDA onboard, and D tech, just to name a few. So much was discussed in what seemed like a very short amount of time and my head was spinning and still is, but in a great way! And as the day flew by, my mind went back to the original Roche Diabetes Social Media Summit in 2009 - and how industry was hesitant to engage with patients and all things Social Media. Now, 6 short years later, things have changed dramatically and for the better. Patients and industry are working together and our diabetes voices are being heard! Chief Technology Officer of the U.S. Department of Health and Human Services, Susannah Fox�s key note speech focused life hacks and usability, and the patient as collaborator and expert. When Susannah stated �the expert to any condition is the person who has the condition,� and talked about patients creating life hacks out of necessity because what they wanted and needed didn�t exist, everyone in the room living with a chronic illness could relate. When she talked about different patient communities working together to become the change, I kept thinking: YES, she gets it! Speaking of life hacks and patient voices being key - the Patient Voices Life Hack winners submissions (of which I was one,) where damn creative! "I know what I'm supposed to do, but I don't do it,� every person in the room living with diabetes felt understood. Open Notes: Eileen Hughes presentation on Open Notes, a program that allows patients across the country to have access to their clinicians notes on them, enabling them (us,) to become active co-partners with their HCP through an online portal. Leading patients to become more active participants in their disease, overall healthcare, and treatments. Open Notes is a GAME CHANGER! Sidebar: Last year, my cardiologist�s notes on yours truly were transcribed wrong, and my file mistakenly said I had a medical condition that I didn't have. If I hadn�t asked for a physical copy of my notes to be mailed to me, (and followed up that request with a phone call,) the error never would have been discovered and my medical records would still be wrong. Once I notified my medical team of the error, it took a week to correct because the Doctor, Nurse Practitioner and transcriber all had to be consulted. Open Notes would have made both the detection and the correction of the error so much easier and less time consuming. Toronto�s Dr. Joseph Cafazzo, of the Centre for Global eHealth Innovation presentation "How the Industry is Embracing User Experience," had me nodding my head with virtually everything he said, including how insulin pump interface is annoying and how pump design re: buttons and control must be designed to be more user friendly. Another example he mentioned was redesigned of the Target pill bottle by Deborah Adler, whose designed focused on highlighting drug name and instructions, thus making it more easy for the patient to read/access medications at a glance, instead of the focus being on the pharmacy�s name. That example brought home one of his key points re: the importance of empathy in design - and I agree. After all, empathy is key in our lives and it�s key in the design of technologies that allow us to live our lives with diabetes. Jessica Floeh�s presentation successfully articulated something I�ve been bitching about for years - having a chronic illness shouldn�t mean that we should be forced to wear ugly diabetes accessories - My pancreas is busted, not my sense of style. Of course, Jessica expressed herself more eloquently and professionally, pointing out that insulin pumps are only designed by middle aged men who are OK with wearing black clips on their pockets or belts and right next to their iPhones. She also stated that device designers must include women with diabetes, who actually wear insulin pumps, test their glucose, wear CGMS, etc. Women have diabetes. Women wear insulin pumps, so why aren�t we included? Back Story: Jessica is quite the Diabetes Designer herself. Creator of the HankyPancreas (which was also a past DiabetesMine Innovation Summit submission,)and former designer at Intel - wants designs for medical devices to be more inclusive - representing all the humans wearing/using those devices - not just the ones designing them. Hallelujah! VitalCrowd: Very Cool platform designed by t1 Anna McCollister-Slipp, that will engage patients and researchers to comment and make suggestions on existing research projects/designs and come up with new ones - I can�t wait for it to go live! The Diabetes Mine Usibility Innovation Award winners and runners-up included names that everyone living with diabetes are familiar with because their products and services make our lives easier. Checkout the winners, HERE. YYES, the Diabetesmine Innovation Summit was eye opening, informative, and incredibly validating as both a person with diabetes and a Diabetes Advocate and I am so incredibly thankful that I had the opportunity to attend. My thanks go out to Amy and the DiabetesMine team for hosting the summit and for the scholarship, and every person who attended and presented at the Summit. Fore a more comprehensive look at the conference with links to the speakers and slides, read Amy�s article, HERE. For pictures of the event, Click HERE.